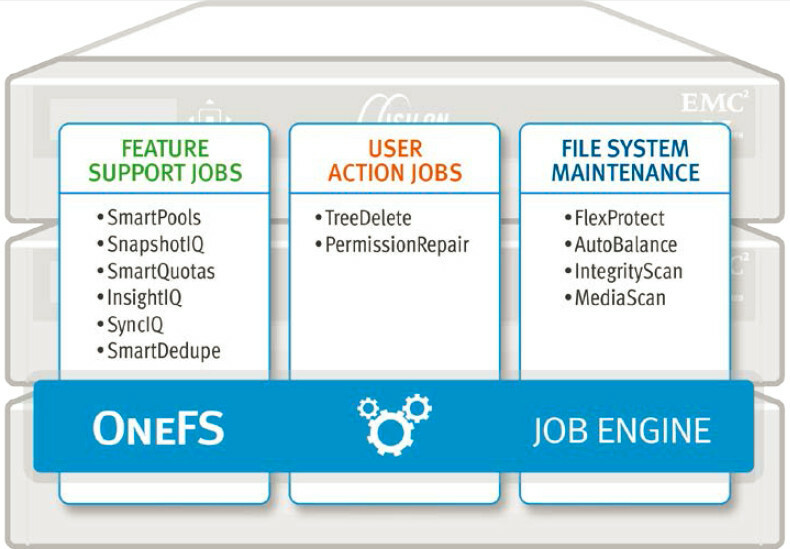 In the EMC Isilon OneFS® operating system, the Job Engine manages the scheduling, reporting, and the initiation of cluster protection and maintenance tasks. A significant benefit of the Job Engine is that it can adaptively manage maintenance jobs based on the amount of cluster resources available. Schedule jobs to run during your cluster’s low usage hours. When possible, use the default priority, impact, and scheduling settings for each job. Ensure that the cluster, including individual node pools, is less than 90 percent full. If the EMC Isilon SmartPools™ software module for resource management is licensed, ensure that default spillover setting is enabled. Set up notification rules to alert you when the cluster begins to reach capacity thresholds and enable virtual hot spares (VHS) to reserve free space that’s needed in case you need to rebuild data if a disk failure occurs. Do not disable the Snapshot Delete job. Run the FSAnalyze job only if you are using InsightIQ. FSAnalyze creates data for the InsightIQ file system analytics tools and provide details about data properties and space usage with the OneFS file system. If you have questions or feedback about this blog, email [email protected]. To provide documentation feedback or request new content, email [email protected].